To end the Tee Ball season the ball park had a trophy presentation this afternoon. 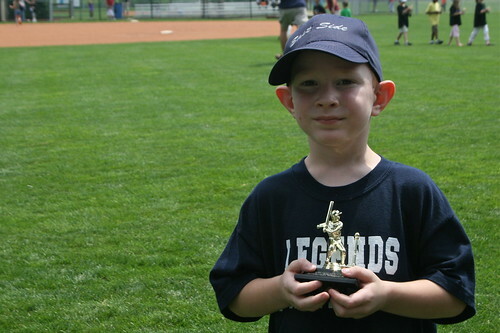 Kade was really excited about getting his first ever trophy even though he doesn't look it in the picture. While driving home from church we drove through a nasty bit of storm. All the way home the kids kept saying "I really hope we have power". I think all these storms have had a negative effect on the kids. We did have power. The women's choir I'm in sang today. This is what we sang.